How many times can the same trilogy be re-released/remastered? 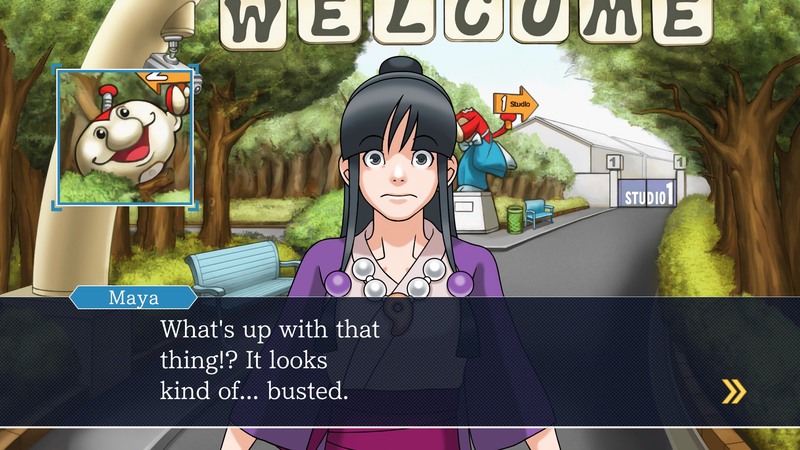 The Ace Attorney series is attempting to answer that question with yet another re-release of its first three games: Phoenix Wright: Ace Attorney, Justice For All, and Trials and Tribulations. It's gone from the DS, to the Wii, to the iPhone, 3DS, and now to 8th gen home consoles. But does this latest update make it worth playing again? If you’re familiar with the series... probably not. If you haven’t played these games before, though, this presents a solid opportunity to jump in. 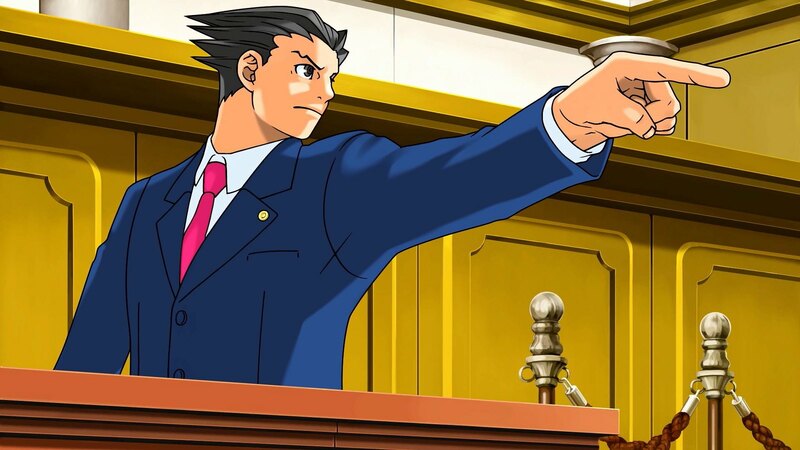 For those unfamiliar with the Ace Attorney series, you play as Phoenix Wright, a fledgling defense attorney who finds himself thrust into the role of heading up a law firm after circumstances necessitate it. Phoenix must defend a host of innocent clients who have all been framed for murder in the most convoluted and over the top ways imaginable, all the while dealing with crazy witnesses, some incredibly malicious prosecutors, and one hopelessly out of his depth judge (and his Canadian brother, occasionally). 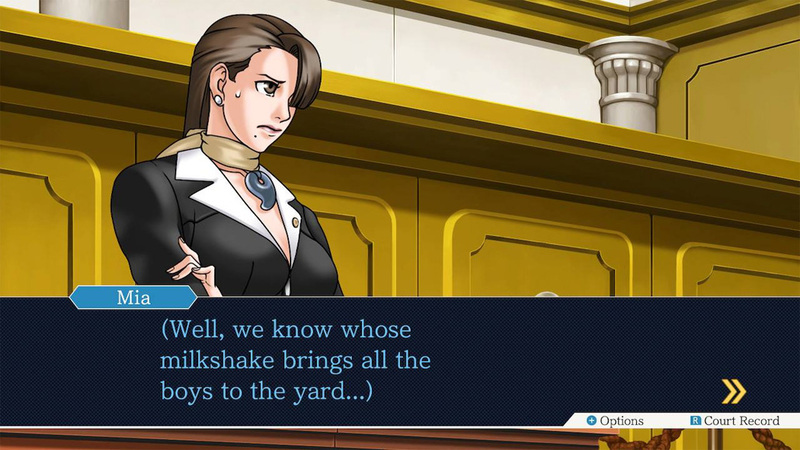 Gameplay is generally split into two parts: investigations and trials. The former plays out like an old text based adventure game akin to something like Grim Fandango or Tex Murphy, where examining your environment and talking to various individuals is necessary to progress. Here, you’ll be gathering evidence and conversing with witnesses about the case, as well as the occasional run in with a detective or hostile prosecutor. While there isn’t much of a challenge to be found here, the game uses it as a means of developing its characters and backstory, as well as giving the player a chance to recover mentally inbetween trial segments. 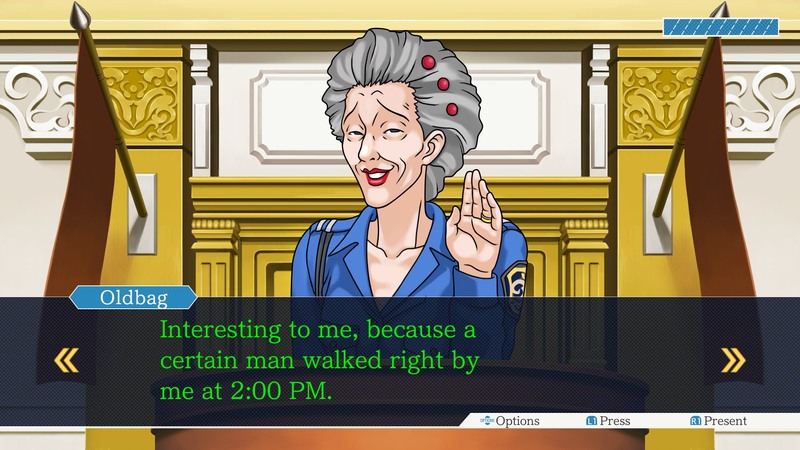 The second half of gameplay takes place in court, where you cross examine those same witnesses and present evidence to reveal inconsistencies and lies in their testimony. Most of the progression of these parts is dependent on the player presenting evidence at certain opportunities. It’s here that most of the challenge lies; present the wrong evidence enough times and you’ll wind up with a game over. It’s surprising how tense some of these sections can be, which makes them a great contrast with the more low stress nature of the investigation portions. It’s a solid gameplay loop, with the low stress nature of the investigation portions complimenting the high stakes of the courtroom sections, and it’s easy to settle into. Cases are very well structured, with enough information given to you to figure out what you need to know to solve the next contradiction without anything becoming obvious. The logic of the cases tends to flow pretty well, which makes it very satisfying to figure things out for yourself. There are some points where things can get frustrating and the game seems to demand significant leaps in logic from you (the third case in Justice For All definitely meets this description), but for the most part, cases remain solvable without teetering too far towards being too easy or too difficult. The catch is, however, that everything said before can also be said about the original games released for the Nintendo DS (or GBA if you’re in Japan). And given the extremely linear nature of the games and how progression is almost entirely based around either selecting a right answer or examining the item necessary to progress the story, there isn’t a particularly good reason to go back to them unless you just want to revisit the narrative again. To be fair, the story and writing in these games are both extremely well done. The overarching narrative is very well handled and features plenty of surprising twists and turns, and everyone in the main cast gets plenty of meaningful character development that carries over from one game to the next. The interactions between Phoenix and his assistant Maya are probably some of the most charming story moments in any video game, and the supporting class has plenty to offer in terms of personality and depth. The cheeky little references to pop culture that pervade this game’s dialogue are the icing on the already delicious cake. The biggest knock towards this compilation is that most of the easy quality of life improvements that could have been made were largely passed up on. The annoyances that existed in past games are still here in full force; a few cases, for instance, penalize the player for merely using an option to extract information from witnesses for seemingly no reason beyond just wanting to make the trial sections arbitrarily more difficult. Certain investigation sections can also become something of a pixel hunt when trying to find the one piece of evidence necessary to continue the plot; some indication of even just the general location needed to look would have been helpful here. These games also seem to have a rather skewed idea of balancing a difficulty curve; all of the cases give you the same allotment of mistakes you can make before receiving a game over. Some of the later cases have mid-trial checkpoints that refill your “health”, or the allotment of mistakes you can make, but others don’t, leading to a rather curious scenario where a case that demands 20-25 correct answers to win the trial gives you just as many mulligans as a case that demands less than 5. Games are supposed to get more challenging over time, no doubt, but this feels analogous to a Zelda game where you’re forced to fight the tutorial boss and Ganon with the same number of hearts. If there is something to be praised in the improvement section, it’s probably the save system, which at least allows multiple saves and doesn’t force you to quit and reopen the game every time you do so. That being said, the more convenient save system somewhat trivializes the prospect of failure, given how easy it is to reload, and how there are only so many options you can pick before coming across the right answer. It’s overall a step in the right direction, but I think it helps reinforce the notion that the Ace Attorney really needs to address how it handles fail states in the future. The fact that it’s taken this long to talk about the graphics in an HD trilogy is probably a pretty good indication that they’re not really worth considering. The newer models aren’t bad by any means, but I can’t even say they’re really an improvement on the DS era sprites. It just isn’t particularly notable either way... with one exception. The zoomed out shots of the entire courtroom look absolutely terrible now, with the improved resolution making the lack of detail on faces incredibly noticeable. There is no reason this should have gotten through on a supposed "high definition" version. Assigning review scores to HD compilations/remasters is always tricky, because there’s only so much that can be added while still being the older games. At the end of the day, these are still great games, and if you haven’t tried the series out, they’re well worth your while. Simultaneously, there isn’t really anything in this package that makes me view it as the “definitive version,” and I feel more could have been done to make me recommend this over, say, picking up the original DS cartridges or the 3DS version. For a trilogy that’s been ported so often, very little has been done to address the niggles that do exist, and that’s a shame. Not enough to render a guilty verdict on this trilogy, but also not enough to come out of the trial without a few penalties on the record.